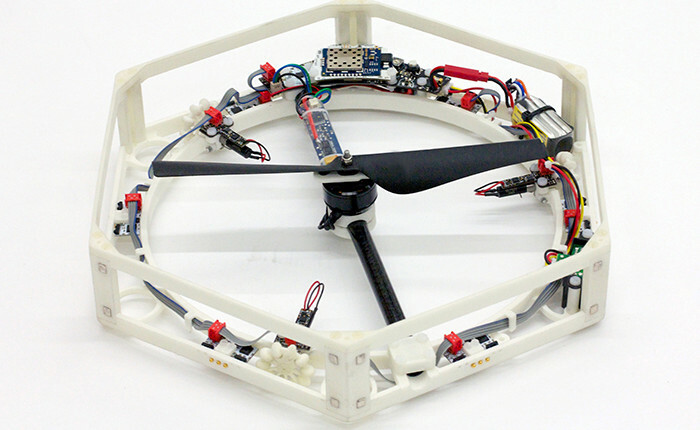 The individual modules of the Distributed Flight Array have fixed propellers that can lift them into the air, but the resulting flight is completely unstable. Joined together, however, these relatively simple modules evolve into a sophisticated multi-propeller system capable of coordinated flight. 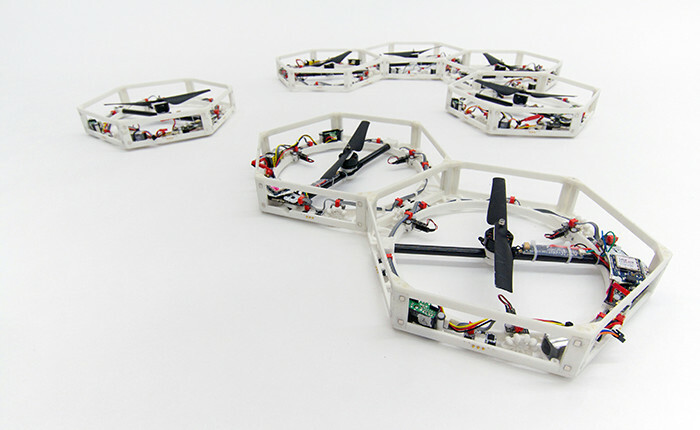 In order to take flight the modules ‘find’ each other by moving along the ground. They connect to one another and exchange information to determine how much thrust is needed for the array to take-off and maintain level flight. It is only then, once the parts become a whole, that the array can take flight. Once in flight, the array must constantly monitor itself and apply corrective thrusts to remain stable. If the array’s leveled flight is disturbed, each module individually determines the amount of thrust required to correct for the disturbance based on its position in the array and the array’s motion. 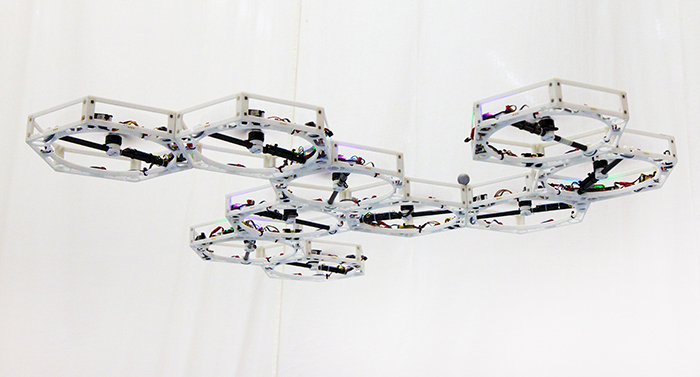 The modules are capable of detaching in flight, resulting in a chaotic disassembly and eventual return to the ground, only for the process to repeat itself: assembly on the ground, coordinated flight, and disassembly in the air. Each module is a self-contained unit with onboard power, sensors, computer and motor. Data captured from the mechanism’s sensors is sent to its computer. The computer combines its own sensor data with data received from its peers to issue appropriate commands to the motor. A propeller attached to the motor provides the necessary thrust for flight and stabilization.